As her favourite colour is purple I knew I had to use that colour. A month or so ago I found some purple sugar and white sugar pearls. I wanted to do a kid cake that was elegant given her age. That was as far as I got until the morning of the day everyone was coming. Talk about a decorating block! I just couldn’t think of anything. Fortunately on the walk with the dogs I got an idea. And it had to be done quickly as I had an hour to do this. Yikes! Not only does she like purple, she likes butterflies so I decided to go with that. I whipped up some buttercream icing like I did for these cupcakes. Before I added the purple I scooped some white into a decorating bag. 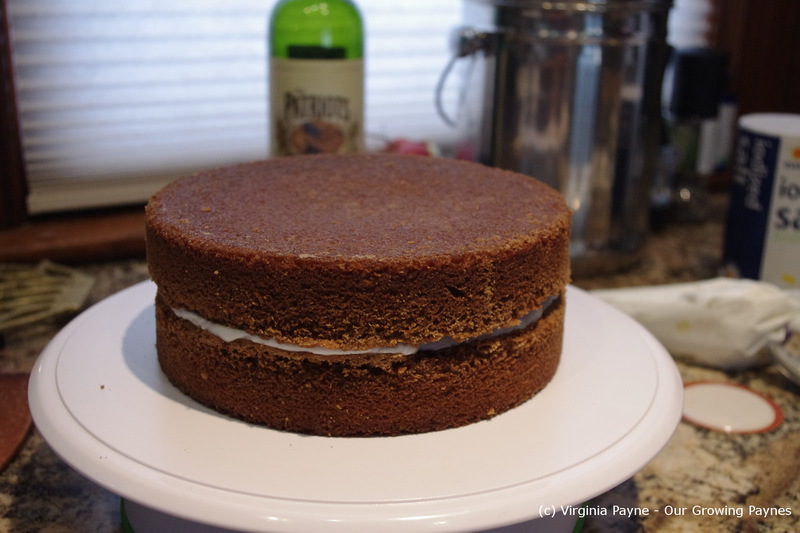 Carefully place the top layer on and brush any loose crumbs off. Ice the whole cake smoothing as best you can. Isn’t this a great purple? 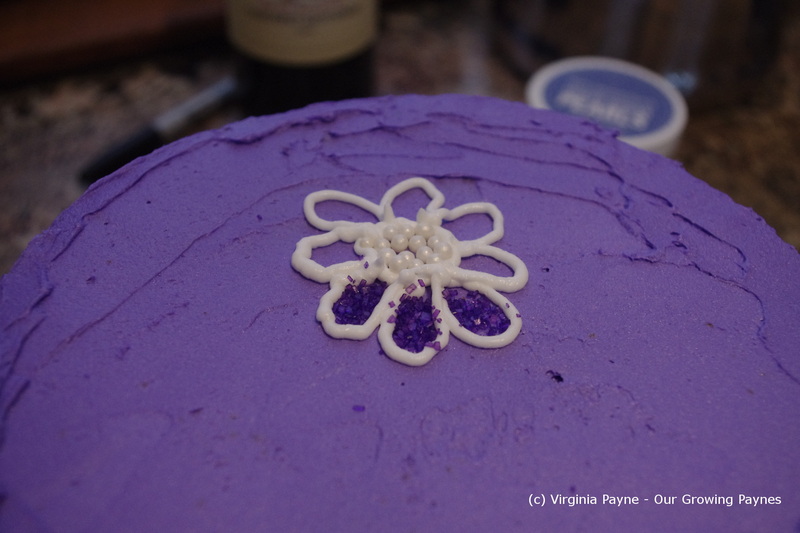 Next I used the white frosting to outline the flowers and butterfly. Finally I got the consistency right and it flowed like it should. In the past I was squeezing with all my might. Too much work. 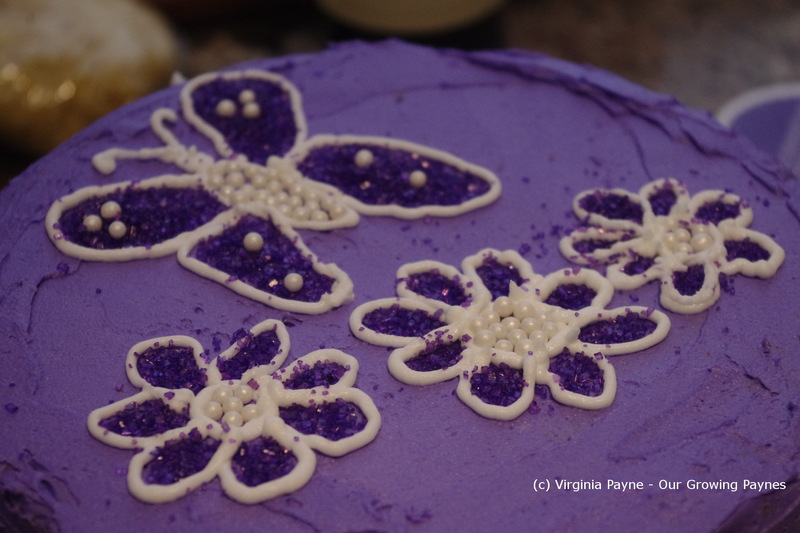 I used the white pearls for the centers and the purple sugar for the petals and wings. I really need to problem solve getting the sugar where I want it to go. There was a bit of colouring outside the lines with this bit. To finish it off I added some icing dots on the sides. 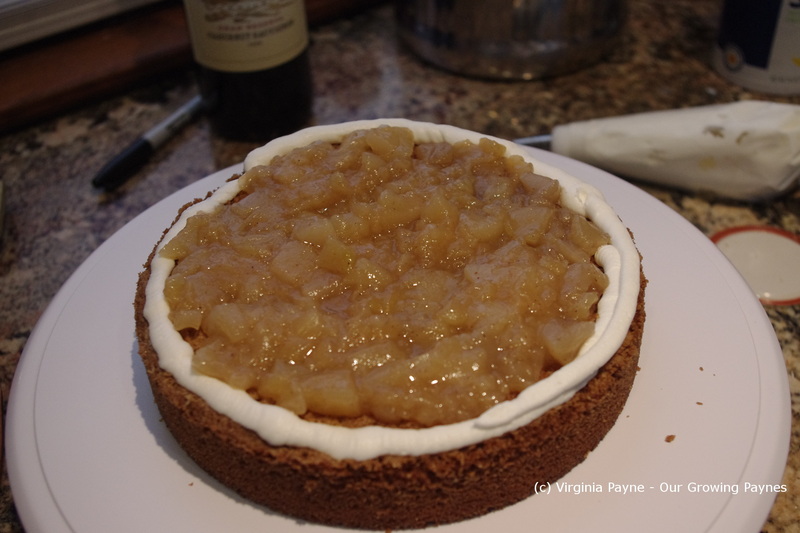 This entry was posted in Desserts and tagged apples, baking, buttercream icing, chocolate cake. Bookmark the permalink. Wow! that’s one heck of a cake:) It’s beautiful!! I love the butterfly:) She’s going to LOVE IT! Happy Birthday to your daughter…. I can’t wait for those pics…I just love everything about your daughters cake! It came out beautifully!!!!!! Thank you. 🙂 His birthday is in June so I have time to plan! can’t wait! 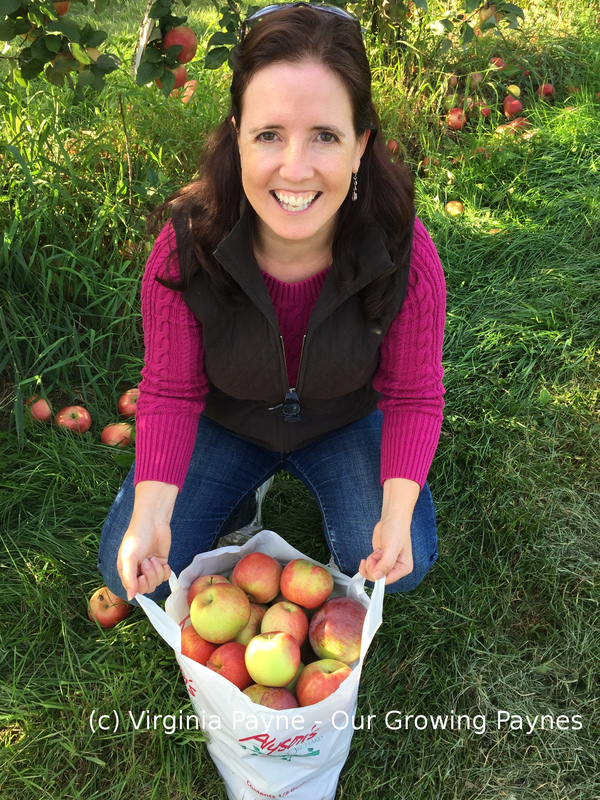 Have a Great weekend:) and as always thanks for sharing…. Thanks, I’ll let her know. Happy Birthday to your daughter. That’s certainly a cake and a half. She must have be thrilled. She liked it. 🙂 They appreciate the effort for stuff like this which is really nice. So fun!! A few years ago, my twin sister put together a cookbook of all the recipes from our childhood years; we celebrated our birthday last week, and I made our whole birthday dinner from that cookbook! It’s amazing how memories if food stay with us– I’m sure your daughter will never forget this cake! What a wonderful idea! Very special. 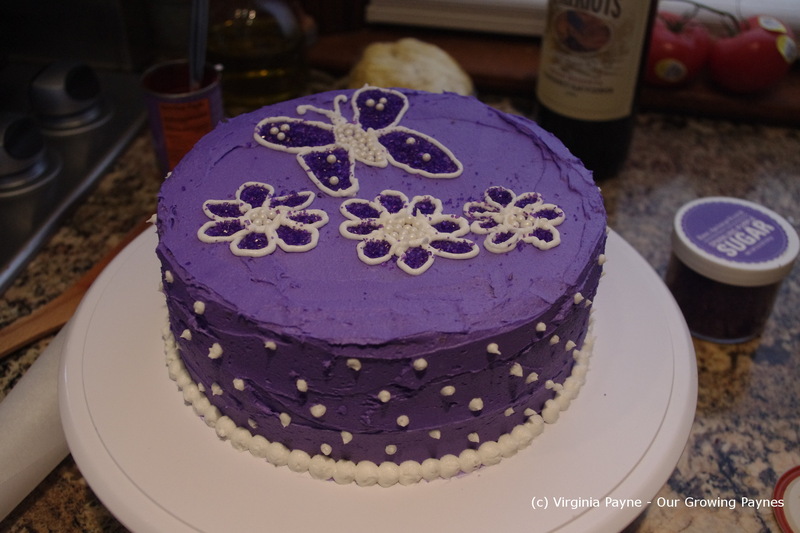 What a sweet cake…love the flowers and butterfly as I’m sure she did as well. Daughters are so~ precious. 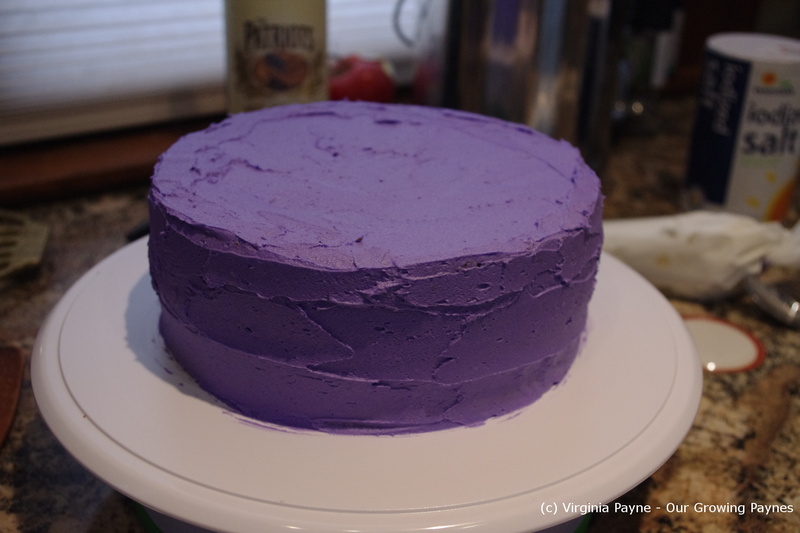 Happy Birthday to your 12 year old… I love purple too and she will love it! Fae. What a fabulous looking cake! Yes, my favourite colours are deep crimson and purple. Having said that, at your daughters age I had my bedroom painted purple walls and white accents…put me right off purple for a while! Her room at her mother’s house has purple walls so we’ll see how long this lasts. At our house she still has the yellow as the main colour that her dad did years ago. I like the idea of purple with the white accents though. A great contrast. Well happy birthday! Wow! Now that’s purple! I bet she was pleased. Good for her. Happy Birthday to your daughter. A cake to remember always. Love that quote! They grow so fast. Wow Virginia the cake is beautiful! Of course, I like purple, too!